This release updates Tag Palette to have multiple views: “tree” and “flat”. The left is old “tree” view, which allows you to find tags through the tag hierarchy, and the right is new “flat” view showing all the tags in a flat list. This feature was inspired by the feature request. Thanks to Jerome. When tagging, out of sight means out of mind. 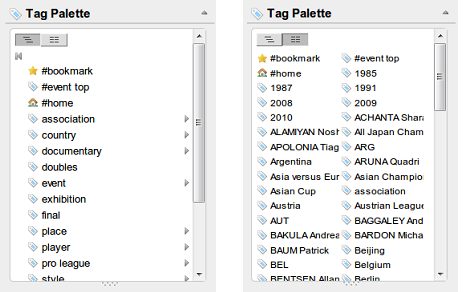 Thus tags that are not at top level on the Tag Palette will tend to be underutilized. The Quick Edit feature, which was added in the previous version 4.22, was extended so that it can be used via the edit button (pencil icon) on the fragment toolbar. Which means, you can quickly edit fragments that have contents hidden or no contents. C’est magnifique. Tag abundance, in an intuitive implementation. Seeing those previously underutilized tags out there really brings out the thought connections. I’ll be using this all the time. Much appreciated. The dropdown version of Tag Palette I think would benefit from a lock, to enable it to persist from screen to screen in the user’s preferred display mode, hierarchical or alphabetical. This behavior would be consistent with the other widgets in the sidebar, which remember their status. The dropdown palette is so useful that I find myself refreshing it a lot, after removing a tag from a fragment, for example. Quick Edit is working very nicely. The expansion tools on the adjacent fragments remain active, and we can even open up multiple edit windows on a single display. Putting Quick Edit on the floating edit button makes that the default mode of editing, so a new user may have some difficulty figuring out how to edit a title until that capability is integrated. I know it’s high on your list. Many thanks for that new slider stop. And for a terrific release overall. Yes. I postponed implementing this because I wanted to take small steps. Probably it will be fixed in the next version. >a new user may have some difficulty figuring out how to edit a title until that capability is integrated. I know it’s high on your list. You are right. A side effect of the change. Hopefully it will be fixed in 5.x elegantly because a title (or name) of a fragment will be the most important part of the 5.x changes.